This Slow Cooker Broccoli Cheddar Soup is the BEST soup ever. It’s the perfect cheesy comfort food. Every time we go to Panera Bread, I always get their broccoli cheddar soup. It’s so good and I wanted to come up with a recipe that I could make broccoli cheddar soup at home. So I looked around Pinterest and I just couldn’t find a broccoli cheddar soup recipe that was easy without a million ingredients. 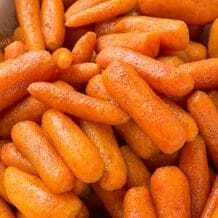 So I came up with my own recipe. 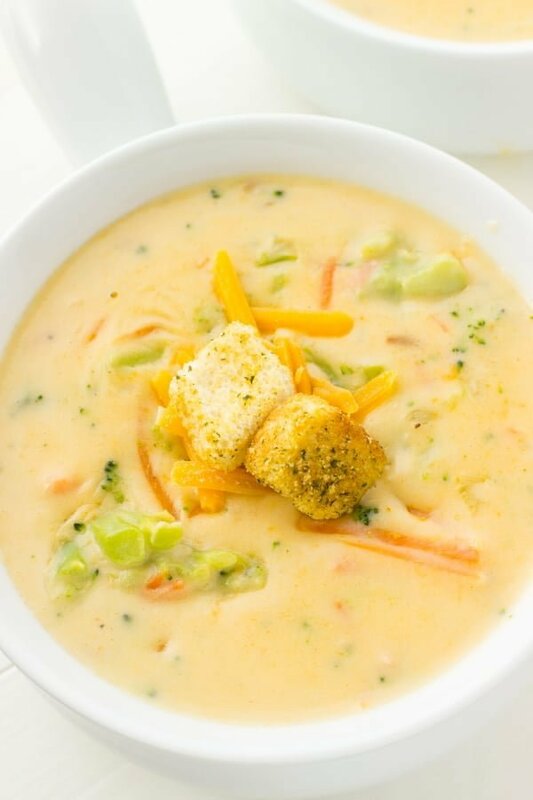 Not only is this recipe EASY to make but it taste just like Panera Bread’s broccoli cheddar soup but better. 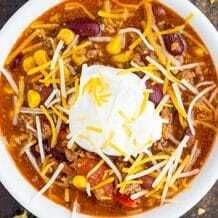 I now make this soup all the time for my husband and I. And the best part, it only takes 2 hours to make in the slow cooker. It also freezes well, so I can enjoy broccoli cheese soup whenever I want. BEST SLOW COOKER: I used my 6-quart slow cooker to make this broccoli cheddar soup. And don’t forget to use these slow cooker liners for easy cleanup. SHREDDED CHEDDAR CHEESE: It’s very IMPORTANT that you use a block of cheddar cheese and grate it yourself. Packaged shredded cheese is coated in starch to prevent the cheese from sticking together which also makes it hard for the cheese to melt properly in the soup. Trust me, I’ve tried every brand of pre-packaged shredded cheese in hopes that it would melt properly and they always failed or left a “grainy” texture to the soup. 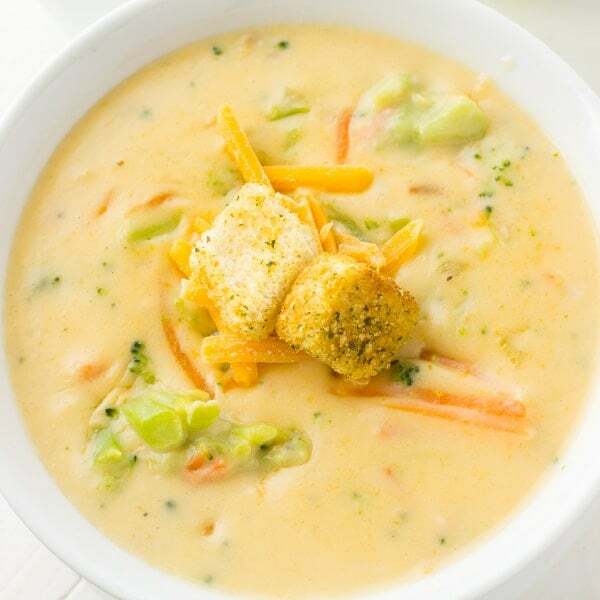 TOPPINGS: I love to serve this broccoli cheddar soup with croutons and extra shredded cheese. 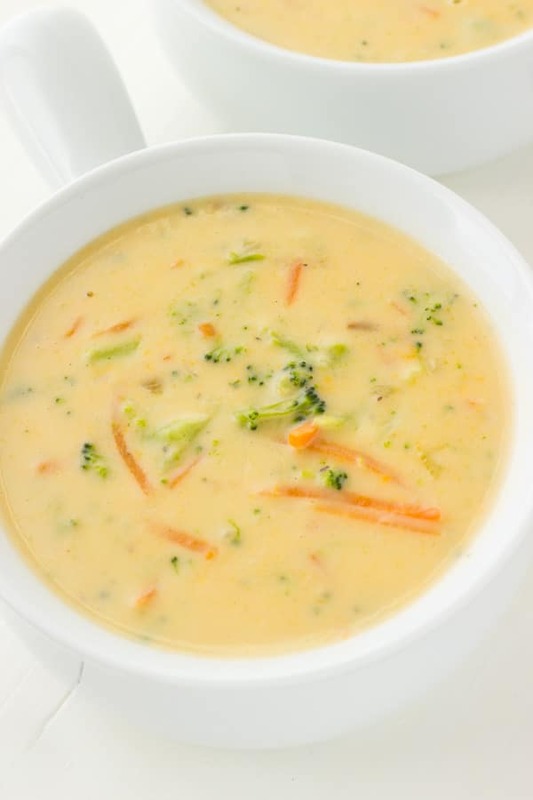 Place broccoli, carrots, onion, cheddar cheese soups and broth in slow cooker. Cover and cook on HIGH for 2 hours or LOW for 4-6 hours. Stir in milk, cream cheese, ground mustard, Mrs. Dash, onion powder, and garlic salt. Cook for 10-15 minutes or until cream cheese is melted. Stir in cheddar cheese until melted. Add salt and pepper. 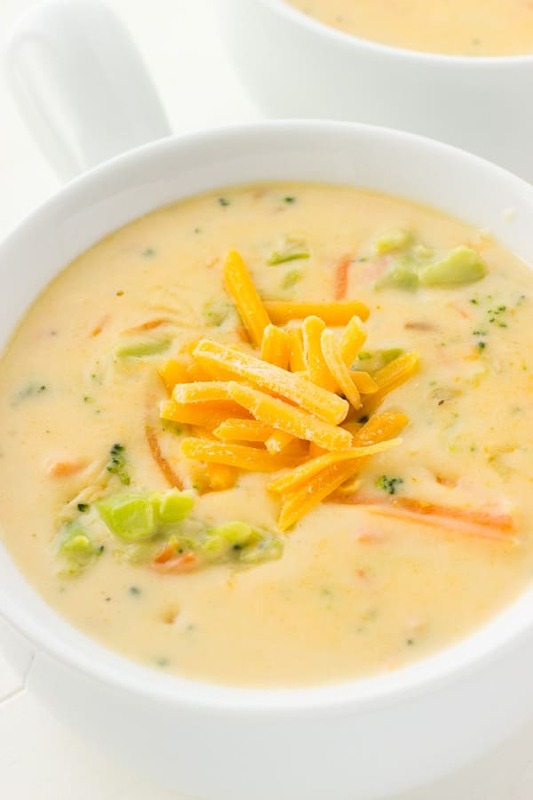 Broccoli cheddar soup has to be one of my favourite creamy soups of all time on par with asparagus soup.. so this sounds like a delicious recipe to try out!